The Wood-Mizer WM1000 saws large softwood, hardwood and tropical logs up to 1.7 metres in diameter. This sawmill uses narrowband, thin-kerf blades to deliver higher log yields than traditional large-log sawing methods. Heavy-duty, accurate, and easy-to-use, the WM1000 features a massive cutting head that moves along a twin-rail frame to convert large logs into halves, quarters, finished boards, or cants for resawing. 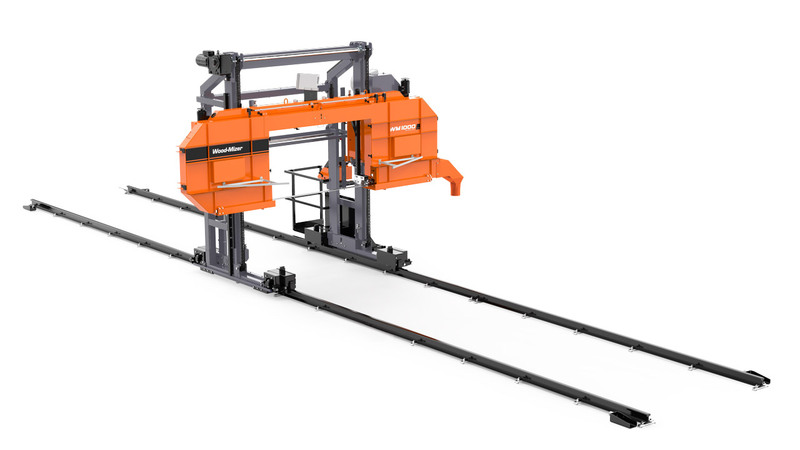 The operator controls all cutting functions while standing on a platform that moves with the head and includes electronic setworks for accurate cutting. The WM1000 uses thin-kerf, narrow band blades that are 50 mm to 75 mm wide, resulting in significantly improved log yield and less wood waste. Built to last and run effortlessly in industrial applications, it easily integrates into existing operations with low installation costs. Simply extend the rails to cut longer logs. Increases productivity and accuracy using powerful Setworks to quickly position the head for the next cut. Moves with the head for close, safe observation during cutting. A sawdust scraper and a heavy-duty lubrication pad cleans and lubricates the contact surface of the blade wheels. The two-sided blade lubrication system cleans and lubricates the blade. Ensures constant tension during cutting. The use of double-carrying blocks reduces vibration and ensures proper support of the blade while cutting. A log of 1.7m diameter can be cut in the centre or sawn through and through with the log on the ground. The thickness of the last board is limited by the height of the rails and is 300mm. This can be reduced if the log is raised off the ground by laying it on bolsters or 'dunnage' - in which case the maximum log diameter is reduced by that amount (see image above showing example of raising log by 200mm to achieve a final board thickness of 100mm). A log of 1.18m diameter can be cut in the centre or sawn through and through when the manual bed is used with the WM1000 in standard configuration. An optional rail support system is available, which raises the sawmill so that a log of 1.63m diameter can be cut. The thickness of the last board is 235mm (this is due to the difference between the height of bed and the height of the rail support system). Sri Murali Krishna & Co commissions a Wood-Mizer WM1000 sawmill to process high value, large diameter hardwood logs into sawn timber.